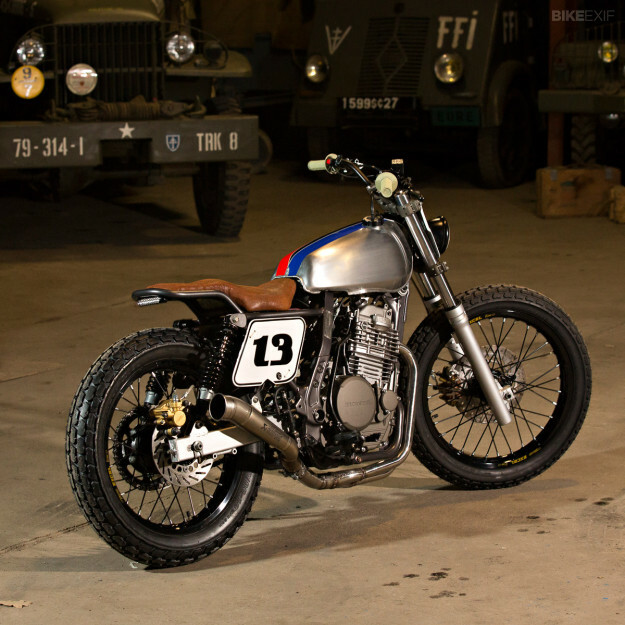 Many builders cite similar reasons for taking up their craft, one of them being a growing dissatisfaction with modern motorcycle design. 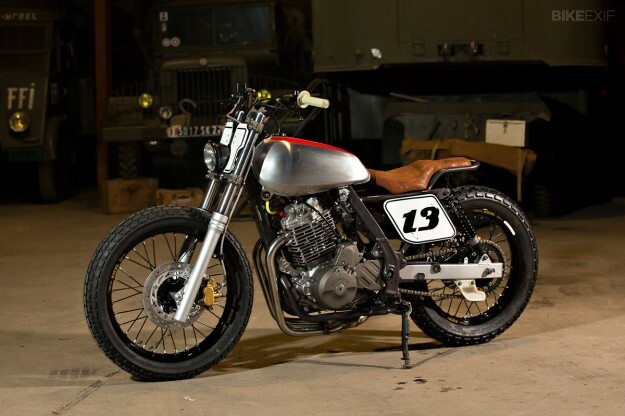 This, and an over-active imagination, led Simon Garcia to tear into his 1989 Honda Dominator NX650—and inject a little style and charm of his own. Originally from a small village in Normandy, France, Simon spent his younger days studying motorcycle mechanics and restoring old bikes and cars. Tired of how “plastic” and “charmless” motorcycles had become, he eventually decided to build something that would appeal to his sensibilities. “The idea was to design a bike that does not look like any other, with unique features,” he explains, “while spending as little money as possible”. 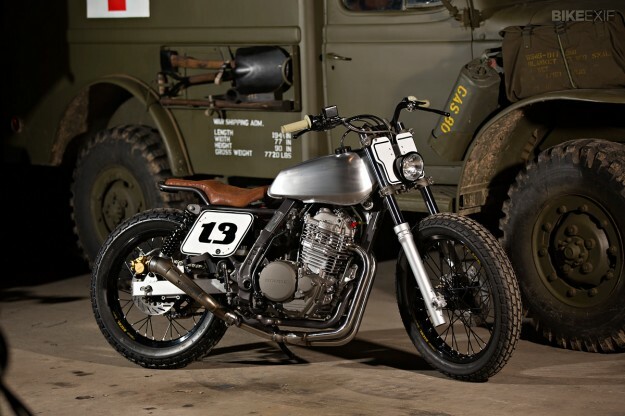 Simon chose Honda’s NX650 Dominator as the base for his project. 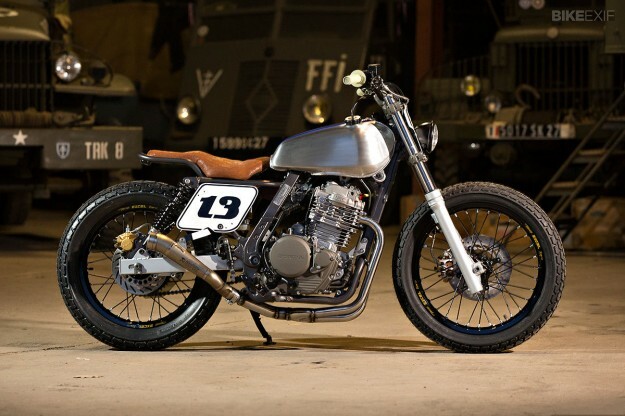 Since he’d completed his apprenticeship at a Honda dealership, he was familiar with the model and liked its simplicity. The donor he found was pretty banged up though—it’d been out of commission for 13 years with a busted crankshaft, cylinder and head. So Simon gave it a full engine rebuild with all-new components, and rewired the bike for good measure. 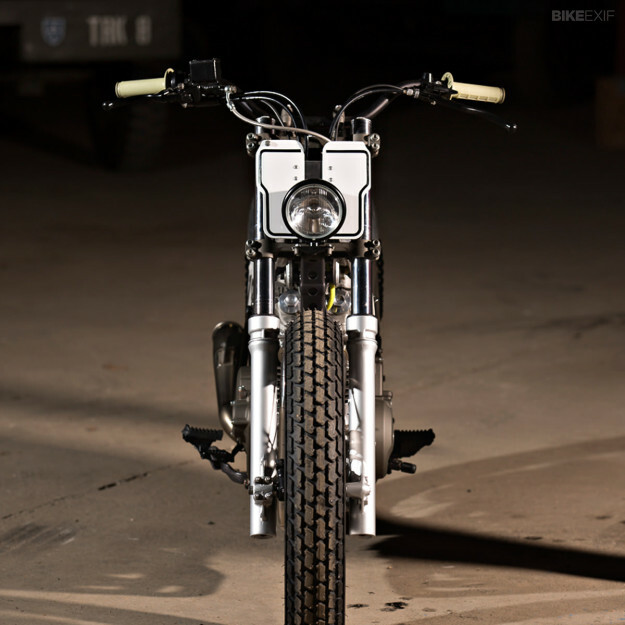 The rear end received the most noticeable changes, starting with a bespoke swingarm that could accommodate dual shocks, to achieve a more vintage look. Simon then redesigned the subframe—cutting, bending and welding the tubes no less than eleven times before he was happy. For the seat, he reshaped the stock Honda pan and foam to save costs, before having it covered in brown leather with red stitching. A Yamaha XT500 fuel tank was sourced via eBay; Simon just had to remove a couple of dings before adapting it to fit the NX650’s frame. 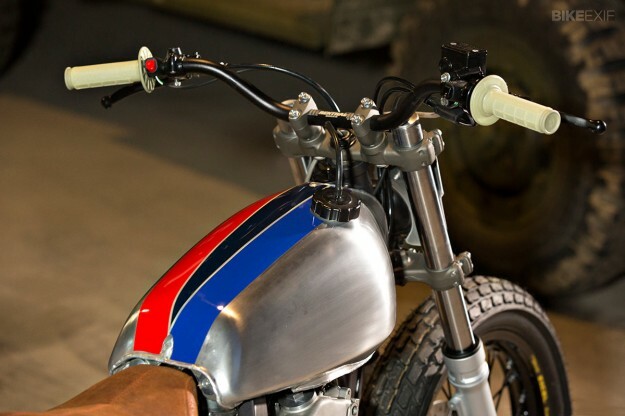 Three stripes were added to the bare metal in the same colors as those on the legendary Honda RC30. The frame was sandblasted and finished in anthracite grey satin. All colors were selected from original Honda colour codes. Simon then shortened the front suspension slightly and fitted black Excel Takasago rims with Dunlop K180 tires. He also fabricated new stainless steel exhaust headers, adding an Akrapovic muffler from a Honda Hornet, and handcrafted the side and front number plates from aluminum. Finishing kit includes Renthal bars and grips. Simon hopes to take on more builds in the future, not only for himself but for potential customers as well. Considering that his first build is loaded with equal doses of quirkiness and craftsmanship, I look forward to watching his career unfold.